It's here! Based on requests from builders across the country, Hy-Lite® has introduced two new 2' x 2' privacy windows in the company's popular Home Designer Collection series. The fixed windows are available in the eclectic Baroque style and the fashionable Prairie style. 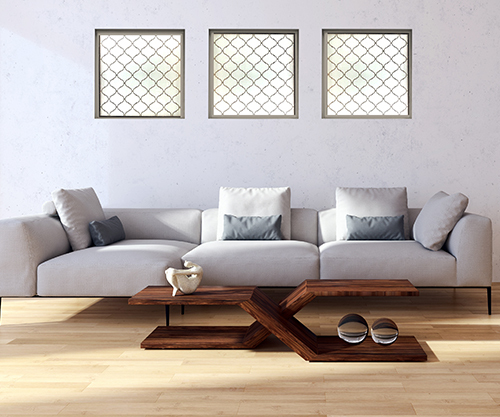 "There's a trend right now of builders using smaller windows in a series of threes to add diffused light and style to rooms throughout the home," says Roger Murphy, president of Hy-Lite, a U.S. Block Windows Company. "This 'rule of threes' is an extension of how people decorate in their homes to create appealing spaces without overcrowding an area. "We're seeing accent privacy windows installed in bedrooms, dining areas, stairwells, hallways and family rooms. When placed together, the decorative windows provide an intimate feeling while enhancing the overall style of the home." The dramatic, show-stopping Baroque design was inspired by classic and modern tile, providing builders a unique way to blend texture into a room. The simple elegance of the Prairie design allows this versatile window to complement a variety of home styles from traditional to contemporary. "These smaller square windows are double-paned with tempered safety glass on the interior and exterior," says Murphy. "The unique decorative design on the interior pane is created through a glass silk screening process. The exterior glass of the window features a privacy texture to ensure natural light flows into the home while preventing people from looking inside the house." Each window comes with a multi-chambered heavy-duty vinyl frame in either white, tan, driftwood or bronze. The windows are designed for rough openings of 24" x 24" and come with a nail fin or nail fin and J-Channel. The Home Designer Collection from Hy-Lite was introduced in 2015 with four window styles including Baroque, Prairie, Mission and Metro. A variety of window sizes are available in the collection including 48" x 48", 48" x 12", 36" x 60" and now 24" x 24".